A) will not be able to interpret stimuli. B) can be expected to lack myelinated neurons. C) will not have a nervous system. E) Both A and D are correct. will not be able to interpret stimuli. 2) What do muscles, nerves, and glands have in common? A) They are target cells. B) They are referred to as postsynaptic cells. C) They synapse with neurons. 3) Integration of simple responses to certain stimuli, such as the patellar reflex, is accomplished by which of the following? 4) The general functions of the nervous system include which of the following? B) in the central nervous system. C) within the spinal cord. D) in the peripheral nervous system. E) anywhere in the nervous system. in the peripheral nervous system. A) provides support to the brain tissue. B) is formed by tight junctions. C) is formed by oligodendrocytes. D) uses chemical signals to communicate with the spinal cord. E) tightly regulates the intracellular environment of the CNS. is formed by tight junctions. A) the depolarization of the unmyelinated axons. B) the nodes of Ranvier in the PNS. C) Schwann cells failing to myelinate axons of the CNA. D) the deterioration of the brain-blood barrier. E) demyelination of the nervous system. demyelination of the nervous system. 8) Which of the following statements is false? A) Squid axons are a model system for nerve conductance. B) The outside of a cell is negative with respect to the inside of a cell. C) Gray matter is the site of neuronal integration. D) Astrocytes can communicate with nerve cells. E) All cells have a membrane potential. The outside of a cell is negative with respect to the inside of a cell. B) still be -70 mV. D) be -69 mV or higher. E) be -71 mV or lower. be -69 mV or higher. A) only permeable to Na+. B) slightly permeable to Na+. C) only permeable to K+. D) not permeable to K+. E) not permeable to Na+. 11) If an otherwise normal nerve cell were made permeable to large negative ions, what would happen? A) The membrane potential would become positive. B) The Na+/K+ pump would not function. C) Sodium would not enter the resting cell. D) The membrane potential would not form. E) Potassium would not leave the resting cell. The membrane potential would not form. A) Na+ and K+ into the cell and H+ out of the cell through an antiport. B) Na+ into the cell and K+ out of the cell. C) Na+ and K+ into the cell. D) Na+ and K+ out of the cell. E) Na+ out of the cell and K+ into the cell. Na+ out of the cell and K+ into the cell. An unknown organism has been discovered. It contains long cells with excitable membranes that scientists suspect are used for rapid information transfer. The membrane of the cell is permeable only to ion X, which carries a negative charge. Active transport pumps in the membrane move X into the cell while simultaneously moving ion Y, also carrying a negative charge, out of the cell. 13) Which of the following is true about the establishment of the resting membrane potential in this cell? A) A negative resting potential is directly produced by the pump moving a negative charge into the cell. B) A negative resting potential is directly produced by the diffusion of Y- into the cell. C) The resting potential of this cell will be zero. D) A positive resting potential is directly produced by the diffusion of X- out of the cell. E) The resting potential of this cell will be negative. A positive resting potential is directly produced by the diffusion of X- out of the cell. 14) When neurotransmitter Z is released into the extracellular fluid in contact with a portion of the cell membrane, channels open that allow both X- and Y- through the membrane. Which of the following is incorrect? A) The membrane will depolarize. B) The magnitude of the potential will immediately increase. C) X- will diffuse out of the cell. D) Y- will diffuse into the cell. E) The channels are chemically gated. The magnitude of the potential will immediately increase. A) opens voltage-sensitive gates that result in the rapid outflow of sodium ions. B) is the depolarization that is needed to generate an action potential. C) is equal to about 35 mV. D) is equal to about 70 mV. E) is a graded potential that is proportional to the strength of a stimulus. is the depolarization that is needed to generate an action potential. 16) Which of the following is a correct statement about a resting neuron? A) The concentration of sodium is greater inside the cell than outside. B) It is releasing lots of acetylcholine. C) The membrane is equally permeable to sodium and potassium. D) The membrane is very leaky to sodium. E) The membrane potential is more negative than the threshold potential. The membrane potential is more negative than the threshold potential. A) ultimately block sodium and potassium movement. B) block all sodium movement. C) not work on the giant squid axon. D) prevent the axon from reaching the threshold potential. 18) After an action potential, how is the resting potential restored? 19) Repolarization of the membrane of a neuron after an action potential is a consequence of which of the following? 20) In the sequence of permeability changes that depolarizes and then repolarizes the membrane of a neuron during an action potential, which of the following changes occurs first? B) The Na+-K+ pump shuts down. E) The Na+-K+ pump is activated. For the following questions, refer to the graph of an action potential in Figure 48.1 and use the lettered line to indicate your answer. 21) The membrane is unable to respond to any further stimulation, regardless of intensity. 22) The sodium gates open. 23) The threshold potential is reached. 24) Repolarization occurs, sodium gates close, and potassium gates reopen. 25) Action potentials are normally carried in one direction from the axon hillock to the axon terminals. By using an electronic probe, you experimentally depolarize the middle of the axon to threshold. What do you expect? A) No action potential will be initiated. B) Two action potentials will be initiated, one going toward the axon terminal and one going back toward the hillock. C) An action potential will be initiated, but it will die out before it reaches the axon terminal. D) An action potential will be initiated and proceed in the normal direction toward the axon terminal. E) An action potential will be initiated and proceed back toward the axon hillock. Two action potentials will be initiated, one going toward the axon terminal and one going back toward the hillock. A) A stimulus that affects the membrane's permeability to ions can either depolarize or hyperpolarize the membrane. B) The rate of transmission of a nerve impulse is directly related to the diameter of the axon. C) The resting potential is maintained by differential ion permeabilities and the sodium-potassium pump. D) The intensity of a stimulus is related to the frequency of the action potential. E) Once initiated, local depolarizations stimulate a propagation of serial action potentials down the axon. The intensity of a stimulus is related to the frequency of the action potential. A) along myelinated nerve fibers. B) in two directions at the same time. C) along the postsynaptic membrane from dendrite to axon hillock. D) from one neuron to another. 28) Which animal movement could be used to represent impulse conductance along a myelinated axon? 30) Neurotransmitters are released from presynaptic axon terminals into the synaptic cleft by which of the following mechanisms? 31) Which of the following offers the best description of neural transmission across a mammalian synaptic gap? A) Neural impulses travel across the gap in both directions. B) Neural impulses cause the release of chemicals that diffuse across the gap. C) Neural impulses travel across the gap as electrical currents. D) The calcium within the axons and dendrites of nerves adjacent to a synapse acts as the neurotransmitter. E) Neural impulses involve the flow of K+ and Na+ across the gap. Neural impulses cause the release of chemicals that diffuse across the gap. 32) Given the steps shown below, which of the following is the correct sequence for transmission at a chemical synapse? A) increases the sensitivity of the presynaptic membrane to acetylcholine. B) makes the membrane permanently impermeable to sodium. C) stimulates the activity of acetylcholinesterase in the synaptic cleft. D) increases the release of substances that cause the hyperpolarization of the neurons. E) increases the sensitivity of the postsynaptic membrane to acetylcholine. increases the sensitivity of the postsynaptic membrane to acetylcholine. A) because the Na to power of (+)- K to power of (+) pump moves ions in one direction. B) because vertebrate nerve cells have dendrites. C) as a result of voltage-gated sodium channels found in the vertebrate system. D) as a result of the appearance of the nodes of Ranvier. E) because only the postsynaptic membranes can bind neurotransmitters. because only the postsynaptic membranes can bind neurotransmitters. A) increasing the permeability of the membrane to K+. B) stimulating the Na+-K+ pump. C) increasing the permeability of the membrane to Na+. D) allowing Cl- to enter the cell. E) insulating the hillock region of the axon. increasing the permeability of the membrane to Na+. B) the production of an IPSP. D) the membrane becoming more positive. E) the production of an EPSP. the production of an IPSP. D) receptor mode of action. E) Both B and D are correct responses. Both B and D are correct responses. The next questions refer to the following terms. Each term may be used once, more than once, or not at all. 42) Which of the following statements is true regarding temporal summation? A) The sum of simultaneously arriving neurotransmitters from different presynaptic nerve cells determines whether the postsynaptic cell fires. 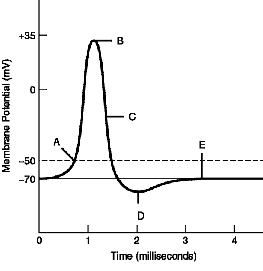 B) The voltage spike of the action potential that is initiated is higher than normal. C) Several postsynaptic cells fire at the same time when neurotransmitters are released from several synaptic terminals simultaneously. D) Several action potentials arrive in fast succession without allowing the postsynaptic cell to return to its resting potential. E) Several IPSPs arrive concurrently, bringing the presynaptic cell closer to its threshold. Several action potentials arrive in fast succession without allowing the postsynaptic cell to return to its resting potential. 43) A single inhibitory postsynaptic potential has a magnitude of 0.5 mV at the axon hillock and a single excitatory postsynaptic potential has a magnitude of 0.5 mV. What will be the membrane potential at the hillock after the spatial summation of 6 IPSPs and 2 EPSPs, if the initial membrane potential is -70 mV? 44) Which statement could be applied to both the nervous system and the endocrine system? A) The final response depends upon the receptor mode of action. B) Specific parts of both systems use chemical messengers produced by axons. C) They both use chemical signaling. D) A and B only are true. E) A, B, and C are true. A, B, and C are true. B) signal-transduction pathways in the cells. C) altering the permeability of the cells. D) causing molecular changes in the cells. The questions below refer to the following choices of neurotransmitters. Each choice may be used once, more than once, or not at all. A) present in cnidarians such as hydras. B) having electrical impulses traveling in both directions. C) being a branching net of nerves throughout the body. E) radiating from a central nerve ring. radiating from a central nerve ring. B) a closed circulatory system. 51) Which of the following statements is true? A) NO is an example of neurotransmitter stored in presynaptic vesicles. B) Biogenic amines are derived from proteins. C) Serotonin is a neurotransmitter synthesized from tyrosine. D) Organisms with bilateral symmetry were first to have nerve nets. E) Learning does not appear to require a specific number of neurons. Learning does not appear to require a specific number of neurons. A) a product of the filtration of blood by the brain. B) functioning to transport nutrients and hormones through the brain. C) formed from layers of connective tissue. D) filling cavities in the brain called ventricles. E) functioning to cushion the brain. formed from layers of connective tissue. B) the brain and spinal cord. C) the sympathetic and parasympathetic system. D) the somatic and autonomic systems. E) the central nervous and sensory systems. the somatic and autonomic systems. 54) What is the main neurotransmitter of the parasympathetic system? 55) Which part of the vertebrate nervous system is most involved in preparation for the "fight-or-flight" response? 56) Which of the following activities would be associated with the parasympathetic division of the nervous system? 57) Which of the following is correct about the telencephalon region of the brain? A) It gives rise to the cerebrum. B) It develops as the neural tube differentiates. C) It divides further into the metencephalon and myelencephalon. D) It is the brain region most like that of ancestral vertebrates. E) It develops from the midbrain. It gives rise to the cerebrum. 58) What controls the heart rate? 59) Which area of the brain is most intimately associated with the unconscious control of respiration and circulation? 60) Which selection is incorrectly paired? A) your alpha brain waves increase. B) activity in the cerebellum has increased. C) your delta brain waves increase. D) your beta brain waves increase. E) the amount of serotonin being released increases. your beta brain waves increase. A) the primary center for motor information for the cerebellum might be affected. B) regulation of body temperature might be affected. C) sorting of sensory information might be affected. D) cognitive response might be affected. E) the production of CSF might be affected. regulation of body temperature might be affected. B) sensitivity to external stimuli. 64) What would you predict would happen if an individual were forced to remain in a cave in isolation for at least two months? A) B, C, and D would happen. B) The superchiasmatic nuclei in the hypothalamus will stop functioning. C) It is likely that the person would think that it is night when it is actually day outside. D) Nervous activity in the thalamus will decrease. E) Nothing would happen, with the exception that the person might be bored. It is likely that the person would think that it is night when it is actually day outside. 65) The motor cortex is part of which part of the nervous system? A) sensory stimuli that regulate motor impulses. C) size of the brain centers of taxonomic groups. D) sophistication of behaviors possible. E) emotions and learning capabilities of vertebrate classes. 72) What do Wernicke's and Broca's regions of the brain affect? 73) If you were writing an essay, which part of the brain would be most active? A) Human emotions are believed to originate from interactions between the cerebral cortex and the limbic system. B) The autonomic nervous system is subdivided into the parasympathetic and sympathetic nervous systems. C) The localization of pain involves the somatosensory cortex. D) The size of the primary motor and sensory areas of the cortex devoted to controlling each part of the body is proportional to the importance of that part of the body. E) The three evolutionary changes in the vertebrate brain include increases in relative size, increases in compartmentalization of function, and decreases in cephalization. The three evolutionary changes in the vertebrate brain include increases in relative size, increases in compartmentalization of function, and decreases in cephalization. A) frontal lobes and limbic system. B) parietal lobes and limbic system. C) occipital lobes and limbic system. D) frontal and occipital lobes. E) frontal lobes and parietal lobes. frontal lobes and limbic system. 77)Identify each statement as TRUE or FALSE. a. All living cells have a resting membrane potential. b. Na+ entry into the axon during depolarization reverses the Na+ gradient across the membrane. c. Hyperpolarization increases the membrane potential of a neuron. d. An action potential occurs fully or not at all. 78) How can instructors address and correct the misconceptions that students have about neurons, synapses, and signaling? Students may think of the membrane potential as an absolute value, rather than recognizing that it is a difference in the electrical potential (voltage) across the neuron’s plasma membrane. The negative membrane potential indicates that the inside of the cell is negative relative to the outside. To test for this misunderstanding, ask students whether the membrane potential of a neuron becomes more positive or more negative when the membrane potential decreases. Students who think of membrane potential as an absolute number will answer that the potential becomes more negative.